The aim of WP 4 was to explore how the electricity generated by wave and tidal energy converters could be controlled to be of a quality that would allow it to integrate with the electricity supply network without unduly increasing the cost of connection, production or delivery. A wave-to-wire dynamic model of an array of wave energy converters was constructed, as was a current-to-wire model of a horizontal axis tidal current turbine farm. These models were used as test-beds for mechanical transmission system design and power conditioning algorithms. Each converter within the arrays was individually adjustable and tuneable. 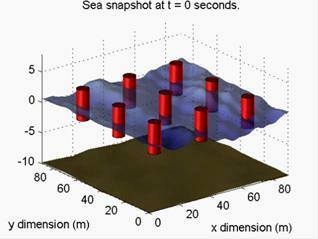 The wave energy field has been modelled as a 2-dimensional sea with multi-directional waves. The effects of differing wave spectra and direction have been tested on the array by adjusting the attack angle of incoming waves and device positioning. 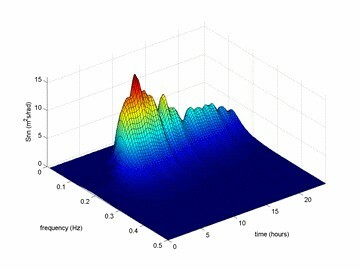 A procedure to synthesise and analyse non-stationary wave time series was developed that allows repeat simulations under the same resource conditions but with different time-series to explore converter designs and control strategies. The model of the wave energy converter is an impulse response driven, time domain implementation that includes the effects of added mass, excitation and radiation forces. The tidal model incorporates variable pitch blade angles and realistic torque characteristics to improve speed control of the rotor. The wave and tidal models both include a mechanical power transmission with a variable speed doubly-fed induction generator and an alternative high-pressure oil hydraulic transmission with an on-board hydraulic accumulator coupled to a constant speed synchronous generator. The offshore electrical collection system and its connection to a generic distribution network (or specific connection points to the existing Scottish model) have been modelled. Novel network power conditioning techniques, such as control of the oil transmission systems combined with power electronic converter control of doubly fed induction generators, have been evaluated. This has identified that that utilisation of this topology can significantly mitigate impact on voltage quality. Existing intelligent power factor/voltage control algorithms were extended and used to regulate real and reactive power output of the wave and tidal energy converters to reduce adverse impacts of resource variability on voltage quality. It is now possible to gauge the network impact of individual or aggregate production from marine energy converters and explore control strategies to improve their integration with the electricity network.